With Junzo Terada's adorable Animal Friends, every day is a party! Farm animals gather their bandmates at the barn to jig and jive until they feel alive. After all, celebrations are better when we're all together! 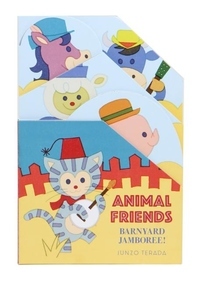 With a new animal friend peeking out from each shaped, layered page, this innovative board book is full of guessing game fun. Culminating in a flap fiesta on the final spread, the animal friends exchange instruments and swim toys, modeling both sharing and community for young readers. Featuring lovable animal friends who know that the best things in life are shared, this smart board book is perfect for interactive reading and playtime fun!